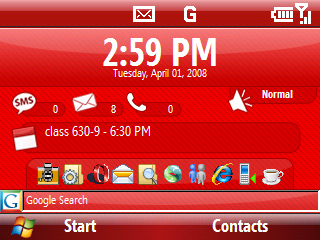 this theme for the moment only has a google search version, i'll eventaully do a non google version. Thanks for downoloading my WM6 Standard theme. You may edit this theme as much as you like for personal use. if you want to release a modified version of this theme for public download all that i ask is that you keep my credits in the original files, and that you notify me of the modification so i can see what you did. And please dont post this else where without proper credit. thanks for downloading, and enjoy. tether your smartphone to your computer open up the folder for your phone and go to Aplication Data > Home and drag over the folder red_delilah and the red_delilah.xml file. un tether your phone and go to your settings > Display > home screen and select the "Red Delilah v1.0" layout and set the color scheme to default. and there you go, its now installed.